Photo from Democrat & Chronicle. Pictured left to right: Susan Maney, Mark Quinn, Peter Lent, Gary Koplun, Matt Sanderson, Steve Leupold, and Kim Falbo. 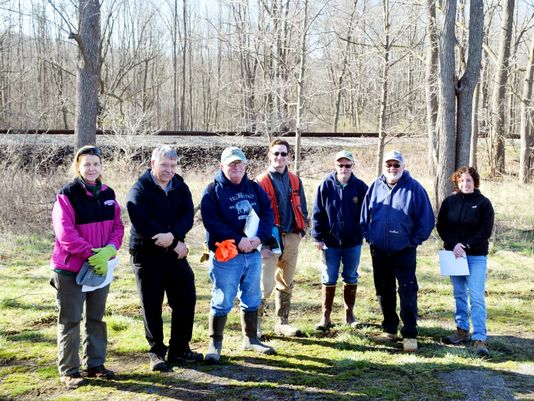 OCWC is partnering with the Seth Green Chapter of Trout Unlimited (TU) and several other local fly fishing groups, along with Monroe County Parks, and New York DEC on a protection and restoration effort: the “Oatka Creek Fish Habitat Assessment and Monitoring Project”. Trout Unlimited has applied and received a grant for the project from retailer, Orvis. The project seeks to improve and monitor the portion of the Oatka trout fishery within the Oatka Park. This will include installing protective cover structures within the creek, improving and stabilizing the riparian corridor, and assessment of fish habitat, followed by long-term evaluation & monitoring. See this article in the Rochester Democrat & Chronicle. OCWC will be coordinating the “Trees for Tribs”/riparian corridor restoration portion of the effort. The Park area is within the the 10 mile corridor that has been targeted for new cover plantings to replace the projected loss of current ash tree canopy that will come about from the now active infestation of the Emerald Ash Borer. As well as heading up that “Trees for Tribs” piece, Pete will be lending his expertise to the assessment/monitoring portion of the joint project.